You download a program from the Internet and click “Install”. The installation routine asks which folder you want the program installed in and whether you want to create a desktop shortcut or not. Routine stuff, right? Well, what isn’t so routine is an option to install a 3rd party toolbar or app along with the one you just downloaded. The little check box is almost always pre-checked which means unless you uncheck it the “extra” software will be installed by default. Before you know it your PC is running at a snail’s pace and your web browser is loaded down with half a dozen toolbars! 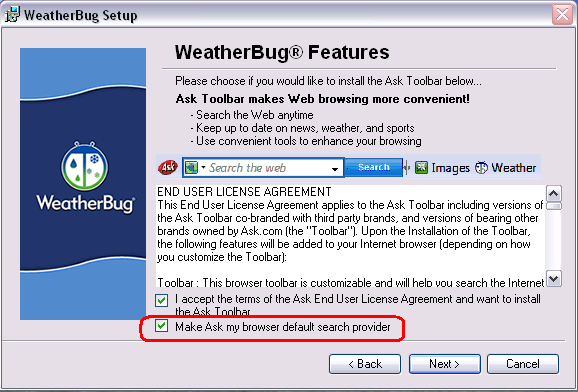 The screenshot above shows the “End User License Agreement” that you’ll encounter should you ever decide to install the popular WeatherBug app. But if you look closely you aren’t accepting the license agreement for the WeatherBug app at all. By leaving that box checked you’re actually giving the installation routine permission to install the Ask.com toolbar along with the Weatherbug app. The lesson here is to always read and consider every option that you are given when installing a “free” software program. Uncheck any that you do not want installed before allowing the installation to continue. Like I said before, many of the free apps available on the web are quite useful, but you need to be extremely careful when installing them lest you end up with a computer that is so loaded up with junk that it becomes virtually useless. And remember, free software isn’t always truly free.